Are you considering buying a Backyard Discovery Prescott Cedar Wooden Swing Set in the coming days or weeks? If so, then make sure to check out this very important brief review which will outline all the main features, pros and cons that you need to be aware of before you decide to buy. This review will also outline several other images to give you a better understanding of what it has to offer plus a series of FAQ that will be of interest to you that have come up across the industry. A. The safe play area required for this swing set is 23'8-1/2" by 23'2" by 14'2"
A. It depends on your skill level and the help you have but in average should take between 6 to 10 hours. Q. 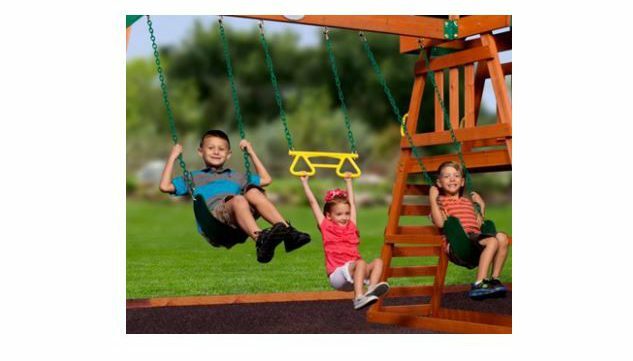 What group is this Swing set suitable for? Q. What is the quality of the wood like? Q. Can Toddler swing seats be added in to replace the Trapeze? 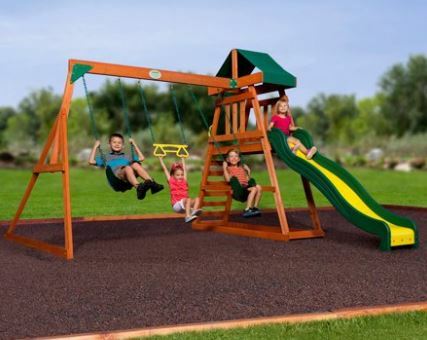 Overall basic and lacks features that other swing sets offer, but it does have a very attractive price tag which is one of the main attractions and is fair value for the price. Upper deck area is extremely small and practically non existent for playing in. Does not include several features such as the glider, sandbox, picnic table, tire swing, a wooden roof or a large upper deck so it is very basic overall but is matched with the appropriate price tag. A lot smaller than you think and is quite small for 10 year olds – should be more like 3 to 8 years. As it is quite small, you may need to upgrade to a larger set as your kids get older but is adequate for beginners. 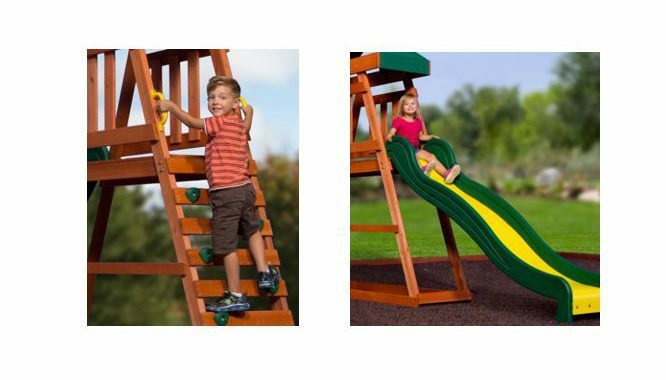 Assembled dimensions is 11'8.5" by 11'2" by 8'2"
Required safety zone is 23'8-1/2" by 23'2" by 14'2"
The upper deck dimensions are 49" by 22"
Have you or your kids any personal experience with the Backyard Discovery Prescott Swing Set in the past? If so, then please share your thoughts and feedback with the wider community by leaving a comment in the comment section below – So that they can learn also!!! 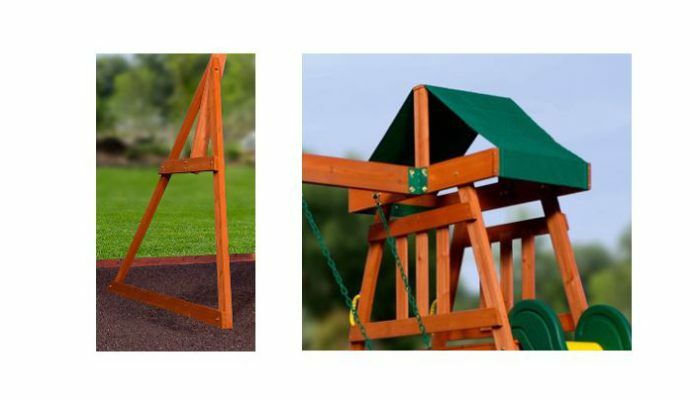 Posted in Swing Set Reviews and tagged Backyard Discovery Prescott, Backyard Discovery Prescott Cedar Wooden Playset, Backyard Discovery Prescott Cedar Wooden Swing Set, Backyard Discovery Prescott Cedar Wooden Swing Set Reviews, Backyard Discovery Prescott Swing Set. You are very welcome and many thanks for taking the time to stop by and leave your feedback – it is greatly appreciated!